(NationalSecurity.news) A Chinese People’s Liberation Army Navy attack submarine stalked the aircraft carrier USS Ronald Reagan last month in waters off Japan, marking the first time since 2006 between a PLAN sub and American carrier, the Washington Free Beacon reported, citing Defense Department officials. The Chinese sub managed to sail very close to the Reagan during around Oct. 24, defense officials told the WFB. The incident occurred as the carrier sailed from its homeport to the Sea of Japan around the southern portion of China. Then, just days later, the Reagan was targeted for a very close flyby involving a pair of Russian Tu-142 bombers that flew within a mile of the massive carrier at an attack altitude of 500 feet. The U.S. Navy said warplanes were scrambled from the Reagan to ward off the Russian planes. The PLAN sub-Reagan encounter also occurred days before the American guided missile destroyer, USS Lassen, was sent to conduct a freedom of navigation operation in the South China Sea. The Lassen passed to within 12 nautical miles of a manmade Chinese atoll in the South China Sea that is located in a highly disputed region, as NationalSecurity.news reported. Chinese military and government officials heavily criticized the Lassen voyage, claiming the United States violated Chinese sovereign territory. The Obama administration, however, insisted the warship remained well within international waters. Disclosure of the Chinese submarine encounter comes as Adm. Harry Harris is visiting China for the first time as the commander of U.S. forces in the Pacific, the WFB reported. Defense officials declined to comment on the record about the submarine encounter. U.S. nuclear-powered carriers are a sign of power projection by Washington. China has been developing countermeasures and area denial technologies and weaponry aimed at keeping U.S. military assets at bay in any future dispute between Beijing and any of its neighbors, especially Taiwan – which it claims as a “breakaway province” – and Japan, its historic nemesis. Both Taiwan and Japan are U.S. allies with which Washington has security agreements. 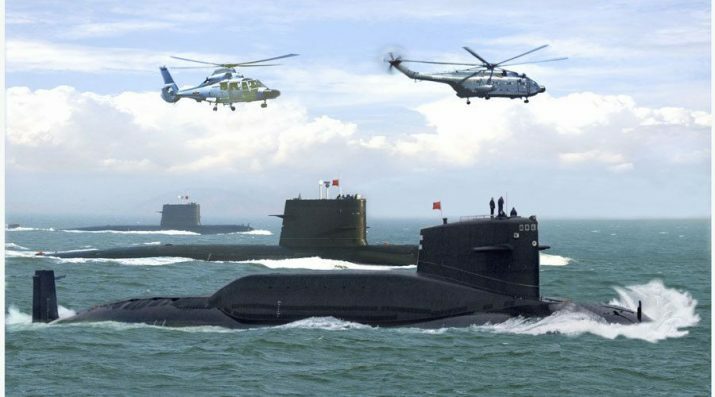 One defense official, speaking on background, told the WFB that the sub’s detection set off alarm bells on the Reagan, though it was not clear whether U.S. anti-submarine warfare aircraft were launched in a bid to locate and track the Chinese sub. Other defense officials noted that the Reagan’s sub encounter was similar to China’s shadowing of the carrier USS Kitty Hawk in 2006. Then, a Chinese sub surfaced within firing range of the Kitty Hawk before being detected. The Reagan and four other warships were on the way to conduct joint naval exercises with South Korean naval forces at the time of the Chinese submarine stalking, the WFB reported. Those exercises were held Oct. 26-29 around the southern portion of the Korean peninsula.